Last week the Islamic State of Iraq and Syria, the militant group better known as ISIS, called for the death of Kuwaiti-American comic creator Naif Al-Mutawa. The series is about a group of 99 metahumans, each of whom has one of the Virtues of Allah listed in the Koran, including generosity, mercy, wisdom, strength, and courage. 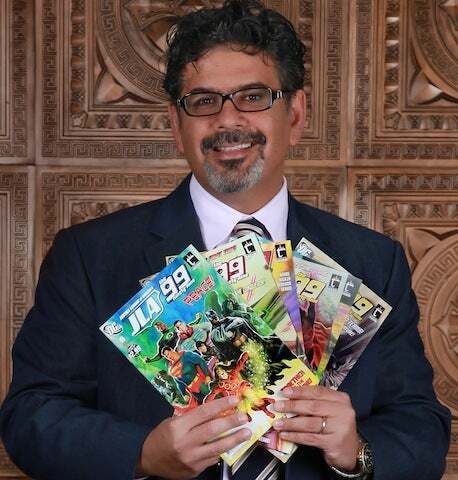 Al-Mutawa’s comic, which launched in 2007 and spawned an animated series, is no stranger to controversy from both inside and outside of Islam. Earlier this year when Saudi clerics issued a fatwa calling it “evil work that needs to be shunned,” the TV series was banned in Saudi Arabia. Numerous Muslim extremist groups have denounced his work, which he says is aimed partially at reclaiming Islam from extremists -- and predictably, he has also taken heat from fundamentalist Christian and Jewish critics for depicting Islam in a positive light. The work has never found the same broad success in the U.S. that it has in some international markets, although The 99 did cross over with the Justice League back in 2010, in a miniseries written by Fabian Nicieza.